The last update was teeny tiny. There was a reason behind that. As I played through that section of the game, I was thinking this: Hey, this is a really excellent part of the game, and I like how it set things up quite well. 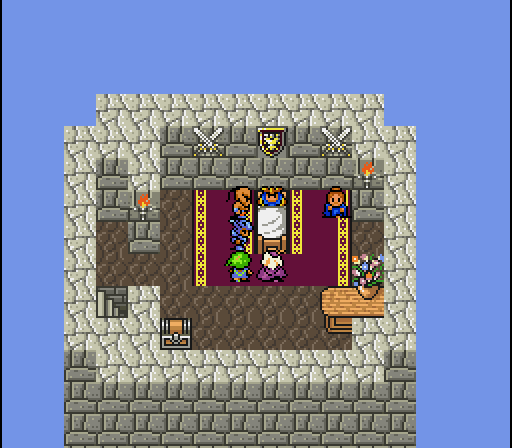 I’m stopping it after the crystal room, for suspense! Yes. I do think in italics. Basically, I need to keep my readers around, and had better damned well have a good reason for a five image update. I think it worked well. The sound of Rydia’s voice had awakened me. Or, perhaps, it was her cure spell. Whichever it was, it had worked. I looked around the crystal room. To the podium where the crystal had rested. Gone. My eyes darted from Edward to Yang to Rydia. There needed to be one more. Rose. So it did actually happen. Kain stole the crystal under Golbez’s order. Golbez took Rose, and promised we’d see each other again. She was insurance of that. I sighed. Rydia looked up to me, I thought I could see tears welling in her eyes. “You okay, Cecil?” Edward stood. 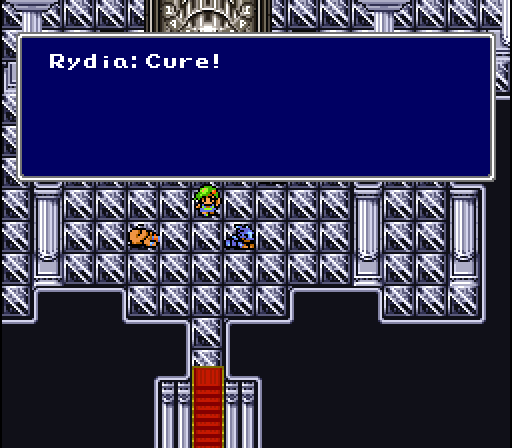 “Yes, I think he is Rydia. But his Rosa was taken.” Yang interjected. “And the crystal, too.” Yes. The crystal. They have three of them. And Rose. “Rose..” The word silently escaped my lips. 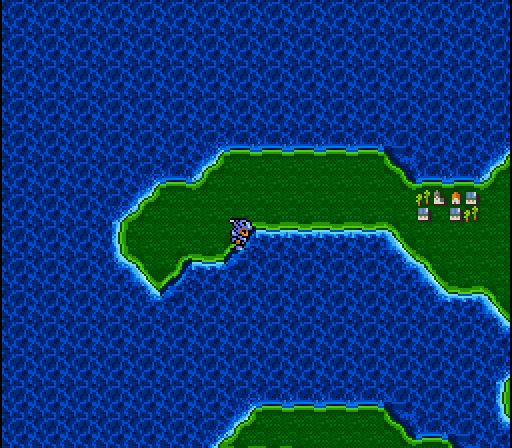 Rydia was right there. “C’mon, Cecil! She’s ok! We’ll just go and get her back!” Edward spoke. “That’s right, Cecil. He never said he’d harm her. She’ll be alright.” Yang patted my shoulder. “Let us help you with this one, friend. We should go rest up, and think up a plan to free Rosa.” I nodded. “Thank you.” It was all I could say. My entire world had been shattered. There’s only one way to go when one is on the bottom. “We need an airship. As you heard from Golbez, I was the commander of the Red Wings. But, Baron has put such a restriction on other countries having airships. If a country were to have one, the Red Wings would surely pay them a visit.” Yang looked at me, frowning; he didn’t like the sound of that. “Is there another way? Maybe we could sneak in, like ninja.” I folded my arms over my chest. “Well. If I remember right, the Red Wings are the main defense force of Baron. 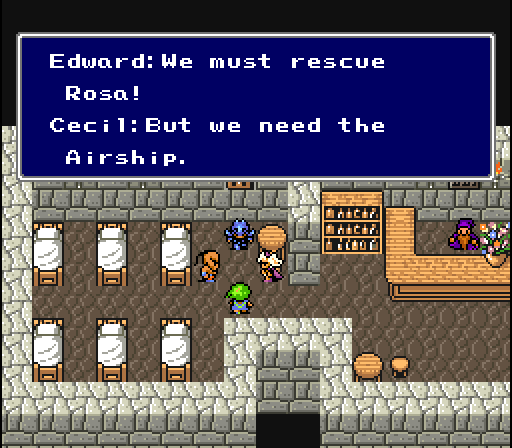 Dark Knights are usually assigned to those airships. We have almost no naval support. If we could somehow sail there, we could more than likely sneak in.” What was I doing? Giving away the secrets of Baron’s defenses to another nation. I was most certainly a traitor, but I didn’t care. The quest for the world’s crystals must be stopped, and I must rescue Rose. Yang’s face lit up. “I can talk to our King. He can arrange a ship for us.” I looked to Yang. “You’d do that for us?” He nodded. “Sir Yang, I am in your debt.” “Think nothing of it, Cecil. Consider it payback for helping us defend Fabul. By the way, who was that man in the Dragon armor? You seemed to know him.” I sighed. “That’s Kain. He’s a Dragon Knight of Baron. Up until now, he was my best friend. During the attack of the village of Mist, we swore that we would one day get out of Baron.” Edward spoke. “I hate to break this up, but we must rest before embarking on this adventure.” I remained silent, but nodded. He was right. During the invasion, the king was wounded. We had to speak to him in his room. 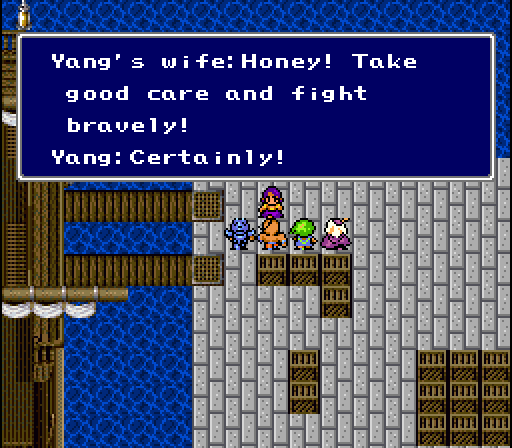 Yang explained the situation to the King. “I understand, Yang. Go and help them; we owe them so much for helping us, and warning us of the invaders. A ship shall be arranged for you as quickly as possible. Hopefully it will help you. Sir Cecil..” I knelt by the bed. “Majesty.” “Cecil, please take this blade. Long ago a Dark Knight who visited Fabul had left it. It will help you. But remember, it is still a blade of the dark side, it will be useless against pure evil.” I accepted the blade. “When everyone is ready, please go to the harbor. The ship will be waiting for you there.” We we ready. “One more thing. 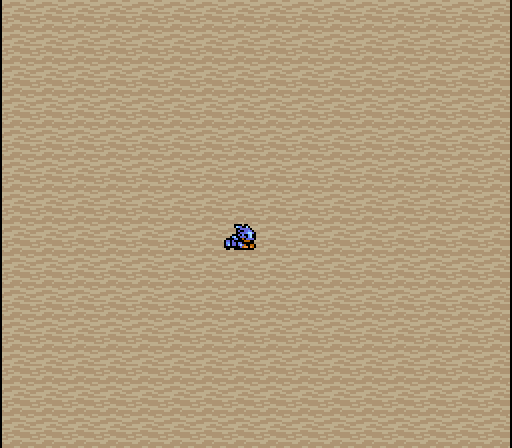 If you fail, and Golbez happens to take the last crystal, the world will face a crisis like it never has before.” We bowed, leaving the King’s chambers. We quietly walked to the harbor, where we were quickly greeted by Yang’s wife. “And you others take care as well. Be sure to watch after Yang, and give him hell if he causes trouble!” Is she overprotective? I noticed Yang turn a slight shade of red. I grinned. “Of course, ma’am.” We borded the ship, one by one. I was the last one on. Making my way to the captain, I had forgotten how the sea had looked from a boat. “It’s a beaut? Ain’t it?” His words took me out of my sightseeing. “Of course.” He stuck out his and. “I’m Captain Johnson, but you can call me captain John.” “I shook his hand. “Cecil.” “I heard about what you did back there Cecil. Mighty fine thing you did for us. While you’re on my ship, you can make yourself at home.” “Thank you.” “It won’t take us that long to get to Baron, perhaps a good day if the winds are with us. You and your crew should just make themselves comfortable. MEN! RAISE THE ANCHOR!” The crew did as ordered. The boat slowly started forward. I had lost myself. The sea was a beautiful sight. I hadn’t noticed Yang approaching me. “Cecil?” Huh? What? “Cecil? !” I turned in the direction that the sound was coming from. “What are we going to do after we arrive at Baron?” I thought for a moment. “Well, first we need to find Cid..” Cid, the loudmouthed flamboyant engineer. Probably working on his next ship. “Cid’s the airship engineer for Baron. But, he’s not exactly Baron loyal. He makes the ships for enjoyment.” Yang nodded. “Well, if we need to find him..he better be alright.” I nodded. Cid knew how to take care of himself. Rydia’s voice broke the silence. “You cold? You’re shivering.” She was speaking to Edward. What was wrong with him? Perhaps he didn’t like traveling by boat. “Nothing. It’s nothing, Rydia.” Or journey continued. Not a shore was in sight, we were surrounded by open ocean. The boat lurched. Something was wrong. “What’s going on!” A gigantic whirlpool formed in front of us. This was not good. We can’t die now, otherwise they’ll win! The crew was in a state of panic. “There’s no way! It can’t be!” What? What were they talking about? I turned to see it. Something was showing itself from the center of the vortex. “The master, and king of the seas! It can only be…” The captain walked next to me. “Leviathan. It rulse the sea. It’s said that any ship that sees the monster will never be seen again.” Oh, this is just ridiculous. “Today, we’re going to try to prove that wrong!” A gigantic sea snake, with the head of a dragon surfaced. “MEN! HARD TO PORT! We’re going to avoid that thing!” The ship lurched again. This was wrong. We should have been turning right now. Giant waves started pounding the side of the boat, their source was the sea monster. The boat shook from side to side. It rocked just a little too hard. “Heeeeeeelp!” A voice. A girl’s voice. Rydia! I spun in the direction of her voice, only to gaze in horror and shock as she was tossed over the ships railing, and into the raging sea. I leapt to the railing, looking for her. It was hopeless, the spray from the intense waves were hindering my sight. I opened my mouth to yeall. Another voice shouted the same thing I was going to. Yang. 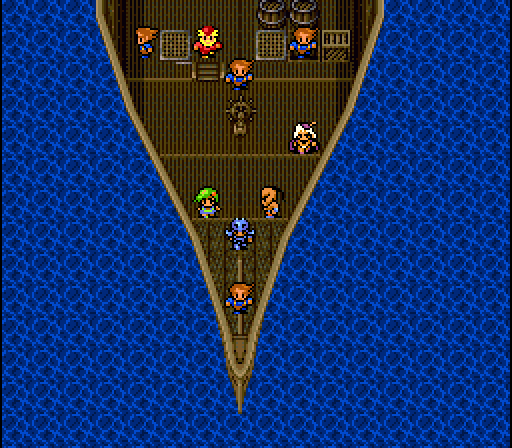 “Rydia!” I watched the Karate man hunch down, and spring off of the boat, leaping into the sea in search of Rydia. I felt my body tremble. Suddenly my movements were out of my control. I could feel myself getting ready to jump. An arm stopped me. “Cecil! You mustn’t!” It was Edward. I fought every impulse to backhand him and leap in after Yang and Rydia. It was hopeless, the boat started drifting into the vortex. Faster and faster we went. The world went black again. I could hear the wood of the boat cracking and tearing off of its frame. Screaming. Yelling. Then everything became a blur. Again, the world was calm. I could hear waves gently crashing. Where was I? My vision slowly returned. A beach. Had I drifted all this way? We weren’t near any shores. I don’t remember swimming. And I know I couldn’t have drifted. How did I get here? I slowly stood. Sand. I could see disturbances. Footprints. “Rydia!” I yelled, starting forward. Nothing. No answer. “Edward!” I looked to my left. Only the waves answered me. “Yang!” I turned to my right. Nothing. No one. I was alone. Stranded. I started walking along the beach, following the footprints I did see. In the horizon, I could see a town. Not just any town. Oh this has got to be a joke. Mysida. Of every town in the entire world, it was the one that I stole the crystal of water from, and my men had killed their forces. This isn’t exactly going to be a warm welcome.. Previous: Chapter 3, Part 2.